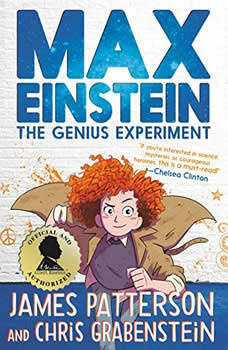 What Harry Potter did for magic, Max Einstein does for kids' imaginations! #1 bestselling author James Patterson has written the first and only children's adventure novel officially approved by the Albert Einstein Archives. "If you're interested in science, mysteries or courageous heroines, this is a must-read!" --Chelsea ClintonMax Einstein is not your typical genius. She...-Hacks the computer system at NYU to attend classes-Builds inventions to help the homeless-And talks to Albert Einstein! (Okay that's just in her imagination)But everything changes when Max is recruited by a mysterious organization! Their mission: solve some of the world's toughest problems using science. She's helped by a diverse group of young geniuses from around the globe as they invent new ways to power the farthest reaches of the planet. But that's only if the sinister outfit known only as The Corporation doesn't get to her first...Max Einstein is a heroine for the modern age and will be looked up to by readers for generations to come.